In many cultures, across the globe, mothers have been massaging their babies for centuries. Infant massage has been a tradition passed down from generation to generation and yet, our culture, at the beginning of the 20th century has predominantly strayed away from this very beneficial, gentle practice. Slowly, as more scientific studies are substantiating the value of touch for infants, more and more new parents are choosing to massage their babies. The benefits of massage are myriad and affect all levels of being, from emotional, physical, developmental and mental. Massaging your baby, which includes elements such as skin-to-skin contact, eye contact and communication, enhances bonding. Massage is a great way for dads to find to bond with their babies. Massage improves circulation and encourages deeper respiration, strengthens the immune system, and decreases pain and tension. It can also help with colic and sleep difficulties. Babies thrive on touch, which is proven to help brain synapses develop more quickly and enhance mental development. If you want to incorporate massage into your routine with your baby, rest assured; it’s not difficult. Although classes and private tutorials are available (see below for resources) that can help to develop your repertoire of massage strokes and exercises to share with your baby, a parent can go far with these simple principles. Have on hand a squeeze bottle with a natural, preferably organic, vegetable oil such as sunflower or almond oil (or if you have some concern that your baby may be allergic to nuts or seeds, choose olive oil). Choose a comfortable location for both you and baby. Remember that if you’re not comfortable and relaxed, it will be difficult for your baby to be. 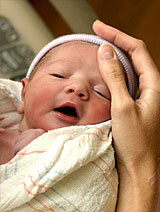 Also make sure the room and your hands are warm, newborns can be very sensitive to cold. Have a comfortable surface and a thick towel to lay your baby on. With your baby right in front of you, sit on the floor kneeling on your knees or with your legs crossed. For a very small baby, you may also find it cozy to massage your baby leaning back against a support with her lying on your bent legs. Now you are ready to start massage. A very simple routine that requires very few specific techniques or strokes is to use long gliding strokes toward the heart on limbs, circling strokes around joints, clockwise circles on the abdomen and also on bottoms of the feet and hands. I have found that starting with the legs and feet is an easy way to familiarize your baby as they are often less sensitive to cold on these extremities. When performing massage use a firm, yet gentle pressure while moving your hands slowly, and calmly to help soothe baby’s nervous system. While massaging, talk to your baby, letting him or her know what you are planning to do, and listen to your baby’s responses. Although they can’t talk, babies do communicate and will let you know what they like. As your baby lets you know what his or her preferences are, you can begin to expand your repertoire. As you both become familiar with massage it will likely become a very pleasurable and enhancing time for you both. When you are first sharing massage with your young one, choose a time when your baby is in a quiet, alert state to ensure he or she is relaxed and less likely to be overwhelmed by the stimulation. Later, as your baby becomes familiar with massage, you can use massage as a tool to help calm him or her down at times of upset. Many parents enjoy massaging their baby as a part of the evening routine to help their baby relax and ease the transition to sleep. Even doing just a bit of massage on the belly or legs during a diaper change can be a wonderful addition to your routine. If you want to learn more about infant massage on your own, I recommend the following books: Baby Massage: The Calming Power of Touch by Alan Heath and Nicki Bainbridge, Infant Massage, A Handbook for Loving Parents by Vimala McClure and Baby Shiatsu, Gentle Touch to Help your Baby Thrive by Karin Kalbantner-Wernicke & Tina Haase. For additional information on infant massage classes in you’re area, contact your local hospital. Or if you’re here in the Corvallis area, contact me or we can set up a private or small group class.